The NanEye is a digital camera that measures about one cubic millimeter in size–or no bigger than a grain of salt. Intended for medical use, the camera was developed by specialized camera manufacturer AWAIBA and the Fraunhofer Institute for Reliability and Microintegration. The NanEye sensor provides delay free, smooth video operation resulting in a safe operation and a clear diagnosis. The sensors are connected to minimal diameter cabling solutions. 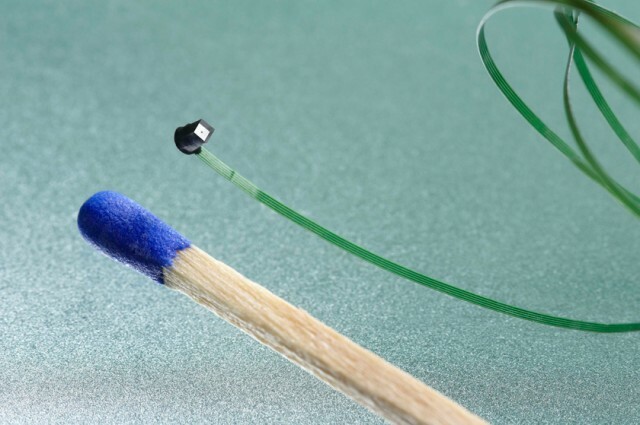 As an option, a small lens an be assembled to the chip, this option does not increase the total diameter of the sensor, making it the world most compact digital camera.